I just love quintessential London - best museums for free, architecture from Neo-Gothic to modern, red phone boxes, extremely diverse culture, even the murky Thames gives it character alongside the London Eye and Big Ben. Best of all, it has the most lush parkland than any other world capital! It was definitely a no brainer in taking full advantage of the long weekend in visiting one of my all time favorite city again. Visiting during winter was definitely not the best time, it was cold with sharp winds, which made it feel even colder. However, the sun peeked through the clouds and made it ever so enjoyable strolling through the heart of the city and Kensington Gardens. I packed some turtlenecks and my trustworthy black wool coat to keep me warm. I noticed that I have way too many dark colors so for some contrast I brought my red and green plaid scarf and pink Tory Burch purse. The length of the coat is longer than I'd like it to be, which makes my legs look stumpy. To elongate my legs I brought my boot wedges that were decently comfortable to walk in, although I wish I had bought a half size smaller. My current favorite skinny ankle jean from Banana Republic is on sale! Plenty of petite sizes are still available! For those who have short legs like me (I usually need pants with a 28inch inseam to prevent folding or alterations), it hits right below the ankle so it actually looks like normal jeans. It's perfect for booties and I love the distressed look. Brought one of my favorite scarves from Ann Taylor (similar here), made me feel cozy and snug. London is so picturesque at night! Hope everyone had a romantic and relaxing Valentine's weekend! OMG!! You are a beauty queen.. I loves your style and dresses... muaaa.<3<3 I love denim jeans for best outfit. 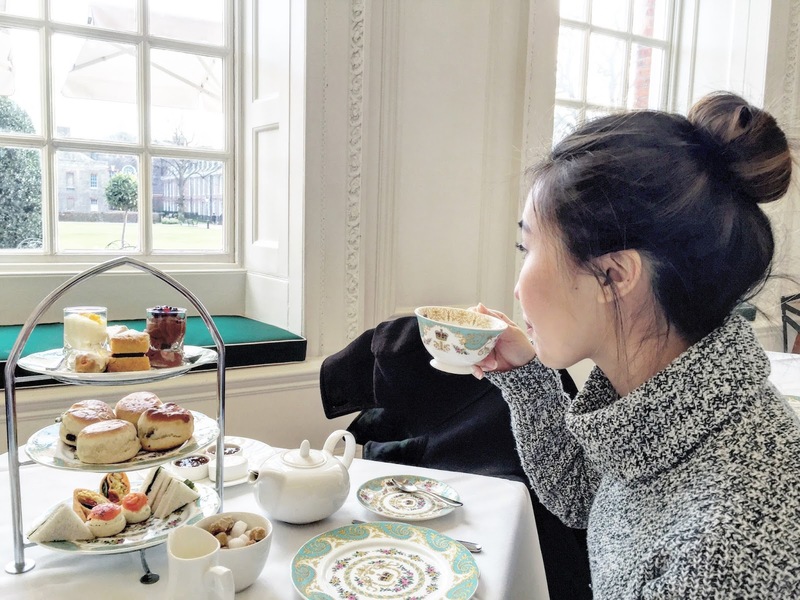 I would have loved to be in London for Valentine's (coincidentally, that's where my boyfriend is living right now, while I'm in New York)...Your outfit (especially boots & scarf) is so cute, and the afternoon tea looks amazing!